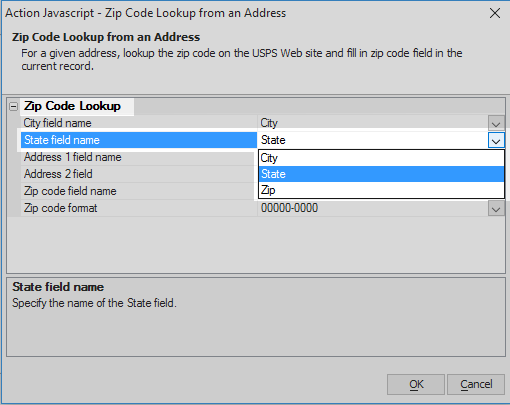 Find a US Zip Code by Entering City and State Data. For a given address, lookup the Zip code on the USPS web site and fill in the current record. Specify the name of the City field. Specify the name of the State field. 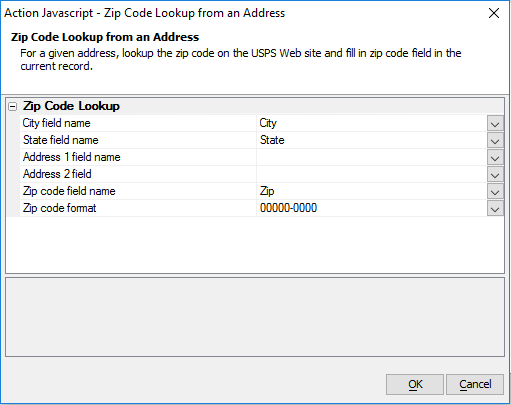 Specify the address 2 field (if any). Specify the name of the Zip field. This field is filled in with data that is looked up on the USPS web site. Specify if you want a 5 digit or 9 digit zip code to be returned. 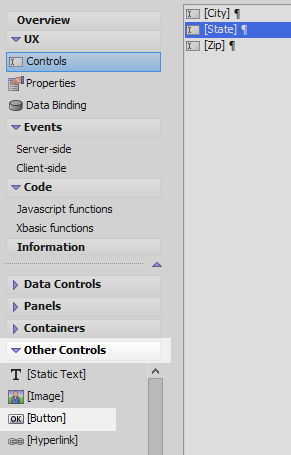 In the UX Builder on the UX Controls page open the 'Data Controls' menu. Click on the [TextBox] option to add a textbox control to the component. Give the textbox the name and label 'City'. 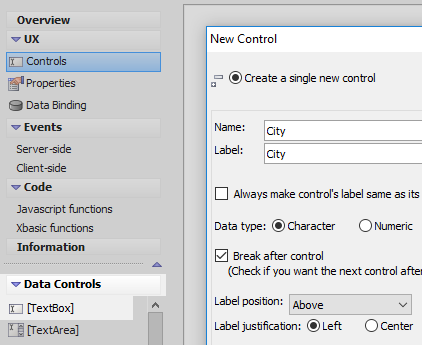 Click on the [TextBox] option in the 'Data Controls' menu a second time. Name and label this textbox control 'State'. Add a third [TextBox] control to the component. Name and label this control 'Zip'. 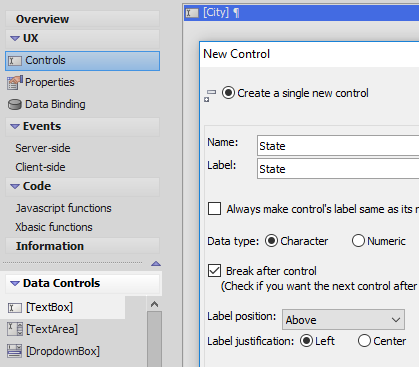 Highlight the 'State' textbox control in the controls tree. 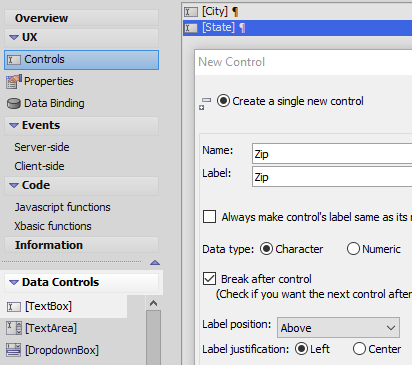 Open the 'Other Controls' menu and click on the [Button] option to add a button control under the 'State' textbox. 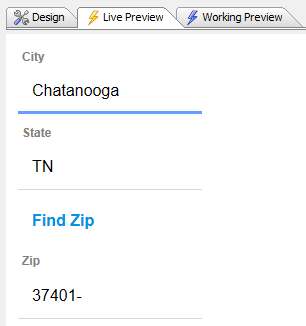 Type 'zip' into the Filter list and highlight the 'Zip Code Lookup from Address' action in the actions list. 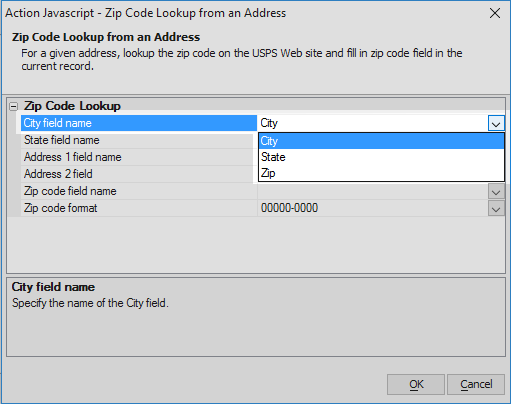 Click OK.
Click the dropdown next to the 'City field name' property in the 'Zip Code Lookup from an Address' action properties list. Select the 'City' textbox. Click the dropdown next to the 'State field name' property. Select the 'State' textbox. 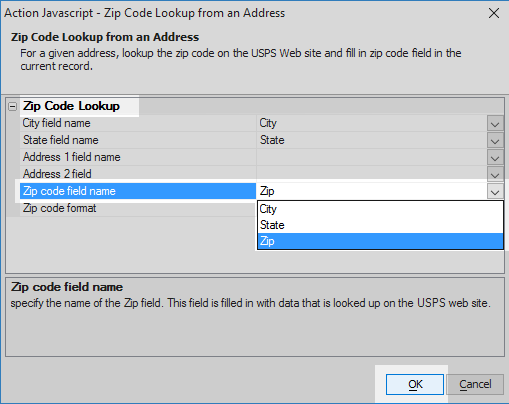 For the 'Zip code field name' property select the 'Zip' textbox and click OK and Save to exit. Run the component in Live Preview. Enter the name of a City and its respective state into the city and state textboxes. Click the 'Find Zip' button. The Zip code for that city should appear.